Earlier this week, Electronic Arts released a new trailer for Star Wars Battlefront, which teased the Battle of Jakku. Fans have already gotten brief glimpses of this desert planet in trailers for Star Wars: The Force Awakens, but gamers will be able to explore Jakku even more when Star Wars Battlefront is released on November 17. Today, another trailer has been released that focuses on the other planets featured in the game, which leads to a brand new website where you can delve even further into these locations. You can visit StarWars.EA.com/StarWars/Battlefront/Planets to take a closer look at Endor, Hoth, Tatooine and another new planet, Sullust, which has been previously unexplored in the Star Wars movies. Each planet on this interactive site features a number of clickable items that offers new details on how these locations were created for the game. Fans also get new information on the weapons, the missions players can go on in each planet and much more. Taking place in the aftermath of the Rebel victory in the Battle of Endor, players will experience the events that created the massive, battle-scarred landscape of Jakku shown in Star Wars: The Force Awakens. Star Wars: Battlefront will allow fans to live out a wide range of heroic moments and intense battle fantasies of their own - firing blasters, riding speeder bikes and snow speeders, commanding AT-ATs and piloting TIE fighters and the Millennium Falcon. These battles will take place on some of the most iconic planets in the Star Wars universe, including Endor, Hoth, Tatooine and the previously unexplored planet, Sullust. Gamers will be able to play as some of the most memorable characters in the original trilogy such as Darth Vader and Boba Fett. 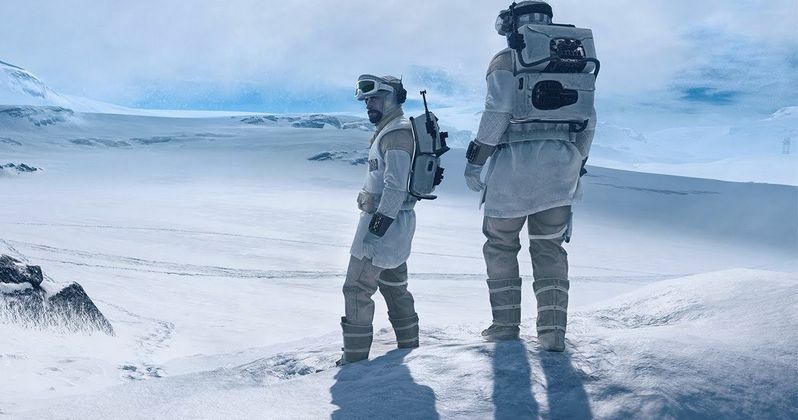 Combining an unprecedented collaboration with Lucasfilm and the award-winning Frostbite game engine, Star Wars Battlefront will deliver an incredibly authentic and immersive interactive entertainment experience featuring photorealistic visuals and epic action in iconic Star Wars locations. Star Wars Battlefront will feature a wide range of modes tailored for different types of battles, from larger 40-person competitive multiplayer to crafted missions that are played solo, with a friend via split-screen offline or co-operatively online. Star Wars Battlefront will be released on PlayStation 4, Xbox One and PC formats starting November 17, just in time for the Christmas shopping season. Just one month later, Star Wars: The Force Awakens will hit theaters nationwide, which is expected to break box office records in just a few short months. Given the massive fan base for Star Wars, it's possible that Star Wars Battlefront could set some video game sales records of its own, but we'll have to wait and see. Take a look at the latest trailer for Star Wars Battlefront, and visit StarWars.EA.com/StarWars/Battlefront/Planets to learn more about the planets featured in the game.